Perhaps the easiest and most common way to dress warm is to layer up. Adding more layers to your outfit means more fabrics which means a warmer outfit. Layering can be about adding a knitted vest, doing a turtleneck under a dress, a shirt under a sweater or a blanket scarf to frame the look. What to think about when layering is playing with the lengths and details of the clothes. If you wear a shirt under a sweater, let the collar, cuffs and hemline be visible! When you layer you can also favorably play with different colors and prints. Choosing warm materials is really about investing in good clothing pieces. Pieces with wool keeps you warm better than clothing pieces in acryl, for instance. Make sure to check the blend in your sweater and choose one with the best combination. Wool in coats are also a good choice as well as clothes with double lining. This is extra important when choosing a good pair of shoes, as you want the lining to help keeping your feet warm. Fleece and flannel are two other materials that keeps you warm! This might be my best tip as the idea of invisible clothes is adding clothing pieces that will help you stay warm, without interfering with the appearance of your outfit (hence the name). These clothing pieces are the one you go for when you really want to stay warm. Like a neutral and tight top under a blouse, tights under your jeans or an extra skirt under your dress. It can also be a defined sweater under a bulky oversized sweater or a light jacket under a voluminous coat. It’s simply about layering, but without the intention of showing the pieces. This is a really good way of wearing the outfit you want and not compromise on the look. Of course the accessories also will help keeping you warm. A knitted beanie, a blanket scarf, a chic pair of gloves, and extra pair of socks etc. The accessories are a good way of adding some color to your outfit too, making it more energizing with pops of colorful shades but not fussing too much about it. As talked about in this post, the blanket scarf is also really multifunctional, which means that it’s a good investment. In our digital era, choose gloves that work with touch screen to always stay warm! Lastly, staying warm is also about choosing the right style. A coat that hits mid-thighs is warmer than a coat that ends above the hips. Pants that goes all the way down to the ankles is a must if you don’t layer with tights. A coat with a high collar, or a sweater, will keep the neck warm better than one sans collar. The sleeves of your jacket shouldn’t be too short but hit the wrists with marginal. A crop top is of course not as warm as a regular top. High-waisted pants and jeans will also keep you warm better. Just think logical you know! Hey such an interesting article, Mia! Actually a lot of people say that cold weather is the perfect time to wear interesting clothes, but I would say you have to be careful in order to do not end up like the Michelin character with a giant puffy jacket. Invisible clothes is a good alternative, I went to Sweden in December a few years ago and I’d say those warm t-shirts under the sweater saved me! But I really love layering, the annoying thing is when you enter to coffees or stores and they have the heating on and then you have to take off everything haha! Choosing the right fabric makes all of the difference! I’m glad you mentioned this as a suggestion. Fabrics can also ensure that you are stylish, sophisticated, and warm at the same time. Your tips are already making me think on how I can update my fall wardrobe! Since it got too cold here, too dang early, this is a post I really appreciate! Your “invisible” clothes idea is genius!! I love layering for layering’s sake, but I really need to invest in some “layering for warmth” pieces that won’t add any bulk. Good idea! those are very great ideas and suggestions for dressing, All of the collection is so gorgeous. Thanks for sharing. Loved this post, such great ideas! I’m all about the warmth when it’s cold. Camel coats are always a great idea!! 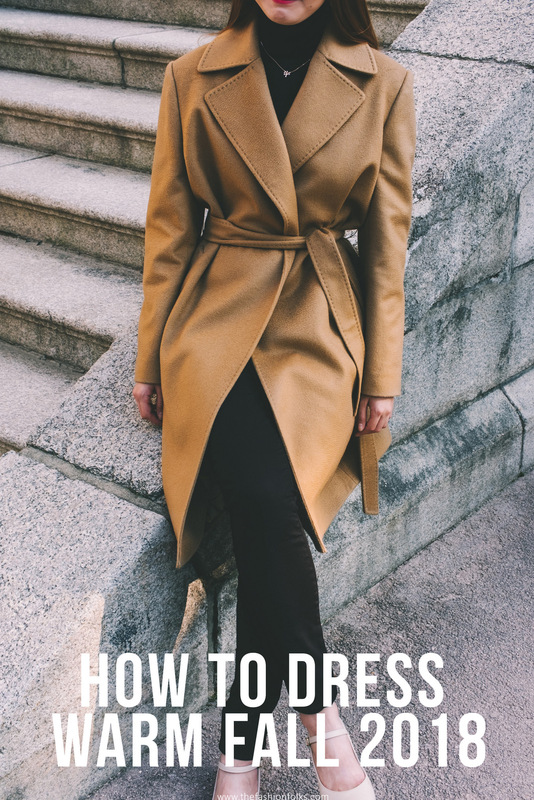 Layering has always been my favorite.I do it everytime.These are some great tips. I love a good chic coat! That camel colored one is amazing! Babe love love this post! So many fabulous look!! I am all about ‘invisible’ clothes! I always have a layer or two under everything I wear in fall and winter! Thanks for the great tips! Great post! To me, it’s all about layering too! Layering won’t only keep you warm but it also gives you more of an opportunity to create different looks!